Rescue workers have arrived on the scene of a crash on westbound Hwy. 212 at Shady Oak Road. One of the vehicles landed well into the ditch and there was a call for extrication. Westbound 94 is starting to look better. The jam has shrunk in the past few minutes with tight traffic now from Franklin Avenue to the Lowry Tunnel. A previous crash had traffic jammed back to near Prior Avenue earlier this morning. Southbound 35E from County 96 to I-94: 11 minutes. 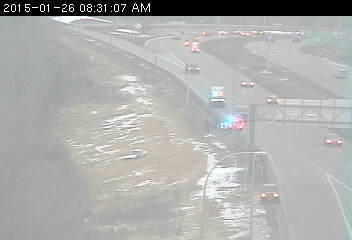 Westbound 694 from 35E to Hwy. 252: 14 minutes. Eastbound is 10 minutes. Northbound 35W from County 42 to Crosstown: 9 minutes To downtown Minneapolis: 20 minutes. Westbound 94 from 35E to the Lowry Hill Tunnel: 22 minutes. Westbound Hwy. 36 from Edgerton Street to 35W: 12 minutes.